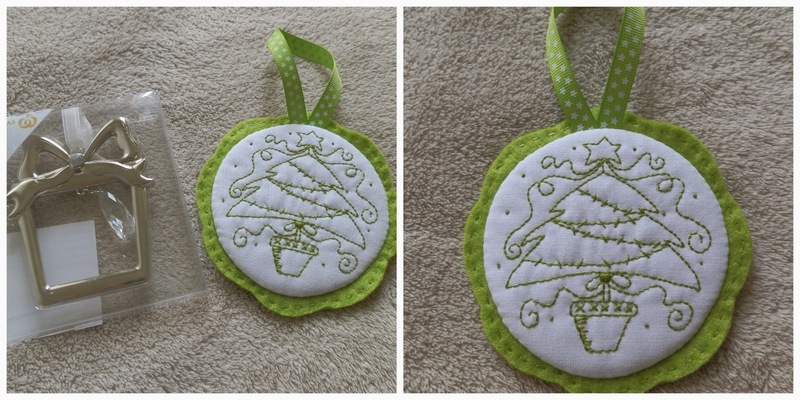 Quilty Bits from the Blue Room: Let's Celebrate, Santa Sack Swap Gifts. Let's Celebrate, Santa Sack Swap Gifts. Here is the final show of the gifts I sent to my partners in the above swaps. Over the course of this year, I have exchanged many gifts with Kali in Mrs Martin's Quilt Shop Let's Celebrate.Kali and I have got to know each other quite well by exchanging lots of e-mails. When we sent our parcels, we would often find we had made or bought similiar items and did lots of laughing about how alike we were. Xmas was my last gift although as it was my birthday as well Kali had to do double duty this time. I know that over the year we have become friends and I look forward to keeping in touch in 2014. Thanks to Karen for hosting this year long swap. 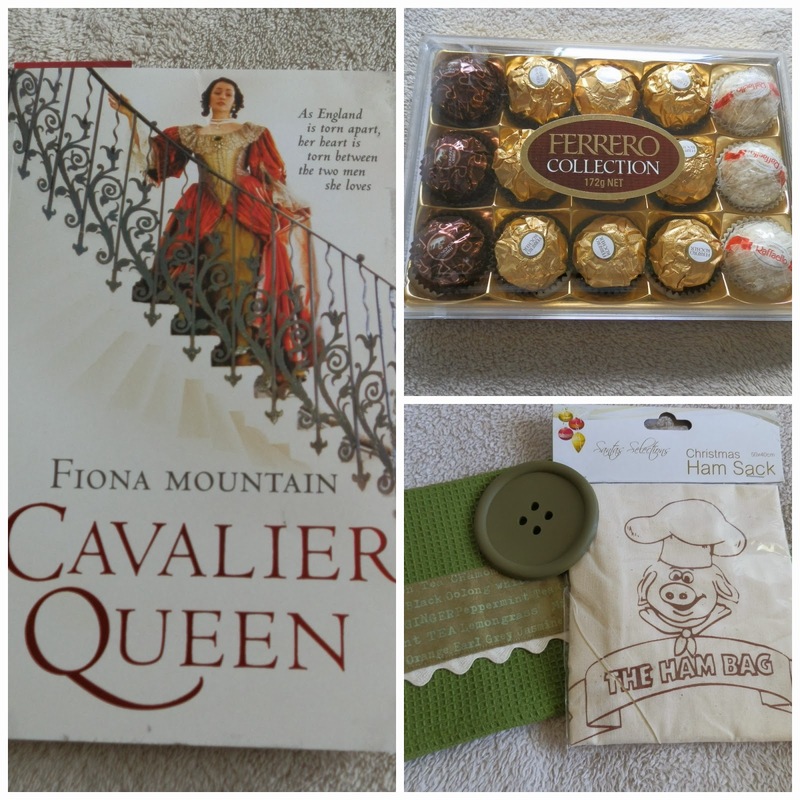 My Xmas gifts : A Xmas stocking, a JOY button, Lindt chocolate and a Table Runner. Thank you so much Kali for my birthday and Christmas gifts. They are all made beautifully as have all the gifts I have received over the year. Below are my gifts to Kali. 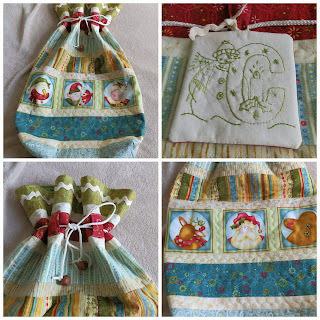 A Sewing Bag, Christmas Goose Bag with chocolates, Lynette Anderson pattern, buttons and fabric, red thread. I have had to borrow Kali's photo as I have been having trouble downloading some of my photos of late and can't find the ones I took. And finally, here are the gifts I sent to Cath at Bits and Bobs for Cheryll's Santa Sack Swap. 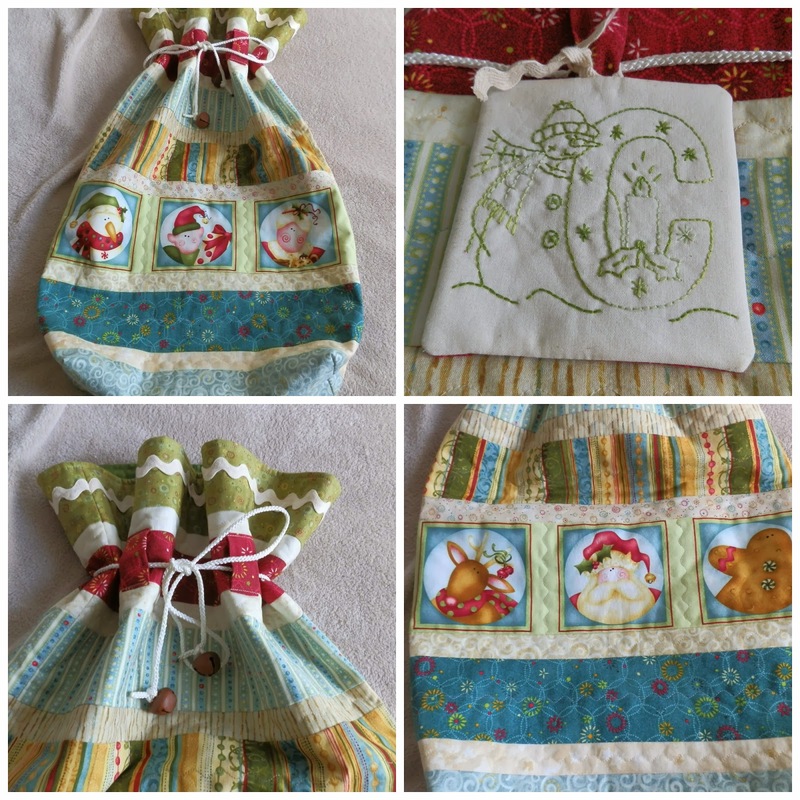 Photos above : Santa Sack and stitched tag, historical novel, chocolates, button mug coaster, decorated t-towel, ham bag for the kitchen, tree ornaments, sewing room goodies and something smelly- soap and sachet. Thank you Cheryll for hosting the swap. I have thoroughly enjoyed this one. WOW! lots of lovely goodies..I'm loving all of the beautifully made items. You have received some beautiful gifts, Noela. Now you can sit back and enjoy them. Wow...so much beautiful handmade creativity in one post! Lovely things given and received ! Hi Noela, I opened my final two gifts on Chrismas Day....choccies and that fabulous book.....great choice and I can't wait to get reading! I haven't reached into this era of history before so am excited to go there. Thank you so much! 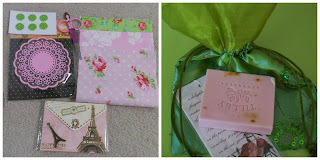 You received some lovely gifts there as well, that dresden plate sewing roll is gorgeous! its so inspiring seeing all these swap gifts being exchanged. You have all made such gorgeous goodies. I hope you have a lovely NY's Eve tomorrow, all the very best of wishes for 2014! Catch up on Xmas Swaps.